The Maine Potato Board presented the eighth annual Maine Harvest Festival in Bangor the weekend of Nov. 17 and 18, and once again featured the popular Caribou Russet potato. PRESQUE ISLE, Maine — The Maine Potato Board presented the eighth annual Maine Harvest Festival in Bangor the weekend of Nov. 17 and 18, and once again featured the popular Caribou Russet potato. This marks the third year the Caribou Russet was made available at the annual festival celebrating the fall harvest from farmers and food producers. The first year the new potato variety was stocked at the festival, it sold out quickly. In the second year of availability, demand was high and hundreds walked away with their favorite potato, which was available to consumers at more stores throughout Maine. This year, phone calls started coming in early to the Maine Potato Board, inquiring about availability of the Caribou Russet. The Caribou Russet hit store shelves with limited supply in 2016. A year later, Hannaford stores began stocking the new variety in produce sections throughout Maine. This year, more Hannaford stores will carry the Caribou Russet, as well as Stop and Shop stores, making it widely available throughout New England. In the time since the release of the Caribou Russet, Maine’s russet acreage has increased by 30.6 percent, or 7,180 acres, in large part due to the demand for the product. “One of the questions we are asked the most is how to get Maine potatoes outside of Maine,” said Flannery. “It is an item that is in high demand. Unfortunately, sometimes when you’re buying potatoes at the supermarket, you don’t know that they are Maine potatoes. 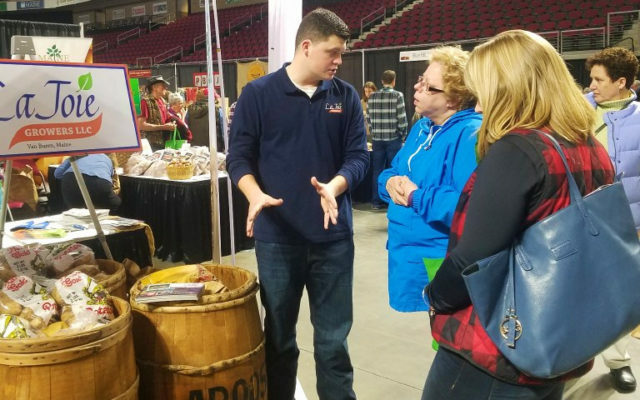 The Harvest Festival, held at the Cross Insurance Center in Bangor, featured 200 vendors, entertainment, contests and demonstrations. The Caribou Russet was developed by the University of Maine, and is a dual-purpose, russet-skinned variety with high yields, mid-season maturity and moderate common scab resistance. In addition to fresh-market consumption, the new variety is also useful for processing markets. For more information on the Maine Potato Board, visit www.mainepotatoes.com.